A collaborative approach integrating systems that treat clients with mental illness and substance abuse disorders not only gains momentum—it makes sense. Ric Kruszynski, director of consultation and training for the Ohio Substance Abuse and Mental Illness (SAMI) Coordinating Center of Excellence (CCOE), was working as a case manager in a community mental health center in Ohio 15 years ago when he had an experience that would shape the direction of his professional life. One of his clients was struggling with mental health and substance abuse issues. Although Kruszynski, who holds MSSA, LISW, and LICDC credentials, and his coworkers had been somewhat successful at stabilizing the client’s psychiatric condition, they had not been as successful in dealing with the client’s substance abuse issues. Kruszynski sought the help of providers who portrayed themselves as a SAMI service. This was Kruszynski’s first face-to-face encounter with how mental health and substance abuse providers play “pass the buck” with clients diagnosed with dual, or co-occurring, disorders. The phenomenon of co-occurring disorders has been well known for decades. Mental health clinicians and substance abuse specialists alike have long been aware that people with severe and persistent forms of mental illness often have serious substance abuse issues. However, slow in coming has been a way of dealing with these co-occurring disorders that makes sense by giving clients integrated treatment options under one roof. One such model is the integrated dual disorder treatment (IDDT) model developed at Dartmouth Medical School. Integrated Treatment for Dual Disorders: A Guide to Effective Practice was published in 2003, and one of the authors is Kim T. Mueser, PhD, a professor of psychiatry and community and family medicine at Dartmouth. At that point, Mueser, in his own words, “decided to take the bull by the horns” and conducted a review of the available literature on the epidemiology of substance abuse of people with schizophrenia. Mueser found that the prevalence of substance abuse in people with schizophrenia was much higher than in the general population—about 50% over the lifetime as opposed to 15%. In addition, it was abundantly clear that the outcomes for people with co-occurring disorders were much worse than for the average person with schizophrenia. Existing approaches for treating dual disorders were generally informal, not research driven, and “not the product of everyone’s best efforts,” according to Kruszynski. The IDDT model uses a collaborative, multidisciplinary team approach to coordinate every aspect of a client’s recovery and ensure that all the service providers involved in the client’s care are working toward a common goal. 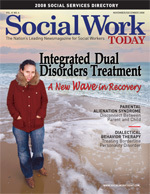 Another important aspect of IDDT is “stagewise interventions” based on the understanding that clients with a dual diagnosis benefit most from incremental successes in recovery, which the authors of IDDT have formalized as “Four Stages of Treatment.” IDDT also takes a radically realistic perspective on the phenomenon of relapse, encouraging organizations to provide clients with continuous services throughout their entire life span, even when symptoms are infrequent, and not to discharge clients when they return to using drugs or alcohol or stop taking their medication. New ways of conducting treatment are inevitably met with resistance, and IDDT is no exception. At the administrative or service provider level, one major point of resistance is eligibility requirements. Some mental health providers take the stand that they can’t verify a client’s mental illness diagnosis if the client has an active substance abuse problem and will not consider him or her an appropriate candidate for mental health treatment until the substance abuse problem is under control. Other providers may say they can’t treat the person’s mental health problem pharmacologically for fear of interactions with their substance abuse problem. Conversely, substance abuse treatment providers may require a client to have his or her mental illness stabilized before accepting him or her for substance abuse treatment. Also, because many states and communities still have a systemic split between mental health and substance abuse services, providers must deal with two sets of billing structures and two sets of regulatory guidelines that make the task of integrating services even more daunting. Kruszynski credits forward-thinking policy makers at the state level for the success of IDDT in his state. “The great thing about Ohio is that both state departments have been extremely committed to breaking down those old barriers. A few larger system issues may never change, but our policy makers have been able to step up and make a number of changes in the interest of doing treatment that works,” he says. As many social workers know, clients can become just as accustomed to the old ways of doing things as their providers and, as such, can present a whole other level of resistance to IDDT. Mueser believes this is especially true for clients who encounter IDDT in a mental health setting rather than an addiction treatment setting. Cynthia Godin, MA, project director of a co-occurring state incentive grant for the Minnesota Department of Human Services, believes it’s the uniquely person-centered focus of IDDT that allows providers to overcome some client-based resistance. She also believes that substance abuse treatment providers have a clinical perspective that makes them particularly adept at tailoring treatment to meet clients’ present needs. While IDDT focuses on individuals with co-occurring severe and persistent mental illness and substance abuse, other mental health and substance abuse treatment professionals are taking the lead in developing integrated treatment for people with less severe forms of mental illness. According to Sue Hoisington, PsyD, executive director of Hazelden’s mental health centers, 70% to 80% of clients admitted to Hazelden residential programs for substance use disorders also have a co-occurring mental health disorder, such as depression, anxiety, or posttraumatic stress disorder. Hoisington recognizes that addiction treatment providers such as Hazelden have not always done the best job when dealing with their clients’ mental health issues. “Back in 1996, I had a patient who had been through one outpatient treatment with us at Hazelden,” Hoisington recalls. “When he came into treatment, he was pretty depressed.” Through the course of his treatment, the client’s depression improved, and he left with what Hoisington felt was a good sense of how to handle his recovery. However, six months later, he was back in Hazelden’s medical unit. When it comes to IDDT, as is often the case with new models of practice, the training that young social workers receive in school has some catching up to do. As is the case with policy in the workplace, the standards for accreditation are tied to current practice. Despite the apparent dearth of information about substance abuse and IDDT in social work degree programs, Godin points out some positive developments and strategies for raising awareness of IDDT at the educational level. Hoisington and Solly both understand the importance of education and training in furthering the IDDT’s cause. Hazelden Recovery Services has already incorporated important aspects of the CDP into their treatment model and teach about co-occurring disorders in their graduate school. They will be collaborating with Dartmouth Medical School faculty to provide clinicians with training in CDP and education about the complex issues associated with integrated treatment. Mueser believes that education will play a major role in dissolving the barriers that IDDT faces. “That’s where the greatest impact can be made,” says Mueser. — David Surface is a freelance writer and editor based in Brooklyn, NY. He is a frequent contributor to Social Work Today.